Sediment is an integral and dynamic part of the ecosystem, and through various natural processes can build-up in estuaries and harbours. Sediments, although not in themselves polluting materials, are sinks for some contaminants bound to the sediment particles that end up in waterways, harbours, ports and seas mainly from anthropogenic sources such as sewage discharges, storm-water overflows, marine traffic, agricultural run-off, industrial wastewater and historically poor environmental management. Ports and waterway authorities have a legal obligation to maintain navigation channels. This results in the need to dredge; referred to as maintenance or navigation dredging. Removal of sediment for new construction activities or deepening of navigation channels is referred to as capital dredging. Most dredging activities result in the material being dumped or placed at designated sites within the marine environment. Adverse impacts from the dumping or placement of the dredged material can be physical (through smothering of habitats and organisms), chemical (through toxicity) and / or biological (though increased turbidity, and from bioaccumulation and biomagnification of contaminants through the food web). Dumping or placement of sediments on the seabed will bury benthos and can lead to damage to habitats and biological communities, especially at newly designated sites. There is also potential for contaminants to be transferred and redistributed by re-suspension and uptake by biota. Since 1986, the OSPAR Convention has encouraged Contracting Parties to minimise adverse impacts on the marine environment through its guidelines for management of dredged material and through actions addressing substances found in dredged material at source. Sediment is an essential, integral and dynamic part of the ecosystem. The elements of the natural sediment movement processes most relevant to the marine environment are erosion, transportation and deposition (riverine, estuary and coastal). Deposition in lower energy areas can cause build-up of sediment in estuaries and harbours. Sediment is also transported locally within the marine environment. Sediment accumulated from riverine deposition, as well as sediment moved by coastal dynamics can cause shallowing of navigation channels and berths. Ports have a legal obligation to maintain navigation channels and berths at advertised depth, thus removal of sediment settled in navigation channels and berths falls to port authorities and marina owners in what is referred to as maintenance or navigation dredging. Removal of sediment for new construction activities or deepening of navigation channels is referred to as capital dredging. Continually increasing vessel size and draft has created a need to deepen navigation channels and berths in ports. This results in increased capital dredging and may increase future maintenance dredging requirements. Dredging is essential to maintain safe shipping to, within and from ports and harbours and for the development of port facilities, as well as for remediation, flood management and to maintain the carrying capacity of marine and coastal systems. Figure a shows the distribution of dump sites for the period 2008–2014. Sediments, although not in themselves polluting materials, are sinks for some contaminants bound to the sediment particles that end up in waterways, harbours, ports and seas mainly from anthropogenic sources such as sewage discharges, storm-water overflows, marine traffic, agricultural run-off, industrial wastewater and historically poor environmental management. Much material dredged from navigation channels within the OSPAR Maritime Area is either uncontaminated or only mildly contaminated by human activities (i.e. close to natural background levels). However, in some areas dredged material is contaminated to an extent that environmental constraints need to be applied when developing management options. OSPAR Contracting Parties have designated sites for dumping and/or placement of dredged material around the coast. These are shown in Figure a, along with the total tonnage of dredged material dumped and/or placed over the assessment period (2008–2014). Figure a: Designated sites for dumping and/or placement of dredged material and total tonnages of material dumped and/or placed over the assessment period (2008-2014) per country. Dumping or placement of sediments on the seabed will bury benthos and can lead to changes in habitats and biological communities, especially in new dump sites. There is also potential for contaminants to be transferred and redistributed by resuspension and uptake by biota. While OSPAR first introduced guidelines for management of dredged material in 1986, dumping at sea had been regulated worldwide since the 1970s with the signings of the Oslo Convention and the London Convention in 1972, which came into force in 1974 and 1975 respectively. By setting out guidelines for management of dredged material, the OSPAR Convention urges Contracting Parties to minimise adverse impacts on the marine environment resulting from dumping and placement of dredged material. The guidelines, originally published in 1986 but revised several times since, set out best practice for minimising adverse effects through guidance on sampling and analyses of dredged material for characterisation and advice on site selection, management options and monitoring, among other things (OSPAR Agreement 2014-06). A decrease of 60–80% in the period 1987–2001 for cadmium, mercury and lead disposed of at sea from dredging activities may reflect the implementation of the guidelines, as well as other international and national regulations. In recent years, contaminant loads have been more consistent, as would be expected in an activity that has been regulated for 30 years. The OSPAR Guidelines encourage Contracting Parties to establish and use national action levels for contaminants of most concern (i.e. those on the primary list in the guidelines) as a framework for decision making. The guidelines also provide advice on best environment practices and processes to minimise adverse impact from the dredging operations. In line with the guidelines, several disposal operations (involving polluted material) were carried out using management techniques (capping or confined disposal facilities) in order to minimise the environmental effects of the operation. The establishment and mechanism of action levels is managed nationally and thus different but equally effective measures are applied in different countries. Lower action levels may be set on different bases such as ecotoxicology or chemical concentrations. Material close to or below lower action levels is considered to be essentially clean or only slightly contaminated and is therefore usually managed without constraints. Upper action levels are often set based on differing criteria, for example, ecotoxicity or on multiples of the lower action levels. Along with the upper action levels, mechanisms for managing sediment that breaches upper action levels vary from country to country, for example, from prohibiting dumping at sea to use of environment management options such as confined aquatic disposal. Although most dredged sediment is classified as clean or only slightly contaminated under existing regulations some, especially from the more developed ports and harbours, may contain elevated levels of contaminants. Unlike wastes from land-based sources, contaminant loads in dumped or placed dredged material are not generally new inputs to the marine environment but the relocation of contaminants already in the marine system (Vivian, 2003). Adverse impacts on the marine environment from the dumping or placement of dredged material can be physical (through smothering of habitats and organisms), chemical (through toxicity) and/or biological (through increased turbidity, and from bioaccumulation and biomagnification of contaminants through the food web). Depending on the frequency and intensity of operations and the natural dynamics of the site, biota may adapt to these changing conditions. The substances that are considered of most concern for the marine environment are those with properties of persistence, ability to bioaccumulate and toxicity. Typically, the most important contaminants associated with dredged material include organotin compounds, trace metals, polychlorinated biphenyls (PCBs), pesticides, polycyclic aromatic hydrocarbons (PAHs) and oil. Tributyltin (TBT) is the main organotin compound of concern and is the most toxic to marine life. Well-known effects of TBT compounds are shell malformation in oysters, imposex in marine snails, reduced resistance to infection (e.g. flounder), and effects on the human immune system. TBT has affected marine wildlife all over the world (OSPAR 2011a). TBT degrades slowly (especially in anoxic sediments) to form the breakdown products dibutyltin (DBT) and monobutyltin (MBT). Although TBT use was banned in the 1980s for small vessels (<25 m) and prohibited from 2008 on all vessels and offshore installations, it is still detected in port sediments due to its persistence and illegal use. Trace metals occur naturally in sediments and waters at varying concentrations depending on regional geology. However, concentrations found in dredged material may be above the natural background level as a result of anthropogenic inputs. Metals of concern include mercury, lead, cadmium, copper, zinc, nickel and chromium. Arsenic is a metalloid of concern. While some of these are essential elements at low doses (e.g. copper, zinc), all are toxic at high concentrations. Mercury is a neurotoxin that adversely impacts the most sensitive developmental stages of many species of aquatic invertebrate and reproduction in fish (Scheuhammera et al., 2015). Lead is an acute toxic compound for mammals and aquatic organisms and can cause blood-related diseases, damage to the immune system and is suspected to have carcinogenic properties (OSPAR, 2011b). In large doses, cadmium may cause peroxidation of lipids and adverse impacts on DNA (Jaminska et al., 2011). High molecular weight halogenated hydrocarbons such as organochlorine pesticides and PCBs are included in a group of contaminants known as persistent organic pollutants (POPs). Although the use of many of these compounds has been prohibited for many years, their resistance to degradation means that they can persist for long periods in marine sediments. Some of these compounds (i.e. PCBs and DDT and its derivatives) are almost ubiquitous in the marine environment as a result of atmospheric deposition (Bogdal et al., 2008). Oil and its combustion products contain a variety of PAHs. Some are known to be carcinogens and mutagens. There is evidence to suggest that PAHs may cause adverse, but sub-lethal, effects in organisms at sites with chronic, low-level contamination in the marine environment. Such effects may induce further changes such as in enzyme activity, reproductive failure and reduced growth potential. Inputs of PAHs to marine sediments originate from the oil and refined petroleum products industry and the users of the products, as well as from atmospheric deposition (OSPAR, 2001). Dredged material can be disposed of deliberately, which is termed ‘dumping’; in all other cases it is considered ‘placement’ (OSPAR Convention, 1992). Beneficial use comes under the heading ‘placement’ and includes activities such as construction, beach nourishment, habitat generation, sediment recharge, land reclamation and coastal protection. Beneficial use is the preferred option for clean sediment but may not be possible in every case as it is dependent on several factors, including particle size and contamination status, as well as economic and logistic feasibility. Although data for beneficial use are included in the assessment, these data have not been reported for long enough for meaningful conclusions to be drawn. This assessment gives an appreciation of the spatial extent and temporal variation in the dumping and placement of dredged material within the OSPAR Maritime Area, as well basic observations on patterns in the amount of material deposited and contaminant loads. It also provides an overview of calculated average contaminant concentration. OSPAR Contracting Parties report annually on various aspects of dumping and placement of dredged material, including quantities, contaminant loads and dredged material used beneficially. The data are collected to support the management of dredged material, not for environmental monitoring. Data on contaminant loads are calculated nationally, based on chemical concentrations measured in a range of samples of dredged material. These data on contaminant loads are used as the basis for this assessment. Annually reported datasets on contaminant loads in dredged material exist in varying degrees of completeness. As outlined in Annex ll of the OSPAR Guidelines for the Management of Dredged Material at Sea (OSPAR Agreement 2014-06), trace metal and arsenic analyses should be carried out on all samples while organotins, polycyclic aromatic hydrocarbons (PAHs) and polychlorinated biphenyls (PCBs) should be determined in samples obtained from areas where it is believed there may be likely sources. Consequently, the trace metal datasets are the most complete. Rather than investigate trends in partial datasets, cadmium, lead, mercury and tributyltin (TBT) were selected as indicator contaminants due to their presence on the OSPAR List of Chemicals for Priority Action (OSPAR Agreement 2004-12) and the completeness of their datasets. While fewer data on organotins in dredged material are available, TBT was included due its persistence, its particular association with ports (through its historic biocide function on shipping) and its continued widespread effects in the marine environment. Information on contaminant loads for each dumping or placement operation, as reported by each country, is not complete. The frequency and extent of testing of dredged material varies across countries, ranging from 0% to 100% of dredging operations for the different contaminants. Data reported by countries were checked for outliers and erroneous values. Where such data could not be explained or corrected, they were excluded. Data were then entered into a database and automated queries were developed to produce assessment figures. These were visually assessed for trends and expert judgement was applied to interpret results. The assessment focused on the nationally reported contaminant load in dredged material and on a calculated average concentration of contaminants per country per year, in mg/kg dry weight (except for TBT which is in µg/kg, dry weight). As dredging amounts and related contaminant loads are subject to many external variables (such as variation in sediment siltation rates due to storm events and harbour development), a calculated average concentration was selected as a proxy metric. Average concentration is calculated based on the reported contaminant loads and dredged material amounts per deposit site. Sites where no contaminant load has been reported are not taken into account in this calculation. For every country, ‘average concentration’, in is then determined as the average of all calculated concentrations. This methodology produced occasional spurious results, even when the original data reported were considered sound. In such cases, the datasets concerned were excluded rather than misrepresented. A statistical trend analysis was not possible, not least because the data used as the basis for the assessment are not necessarily comparable across countries due to differing analytical procedures. However the data should be comparable within countries from year to year. There is also significant variation in the particle size fraction analysed making comparison problematic. In addition, not all material dumped or placed has been subject to chemical analysis, testing laboratories may operate to different limits of detection, and samples containing contaminants at concentrations below limits of detection may not have been treated consistently across countries. Moreover, natural background concentrations, which may differ regionally, have not been excluded from the calculated contaminant load in this assessment, however this may be considered in future assessments. It is acknowledged that the assessment method is neither quantitative nor scientifically robust; however, it does allow for comparison with previous assessments and consideration of long term changes. No assessment values were used in the assessment as action levels vary significantly between countries both in terms of their values and their application thus hampering a quantitative approach. In the period 2008–2014, over one thousand million tonnes of dredged material were deposited in the OSPAR Maritime Area. This value includes material from capital and maintenance dredging. The total amount disposed per country per year is given in Figure 1. 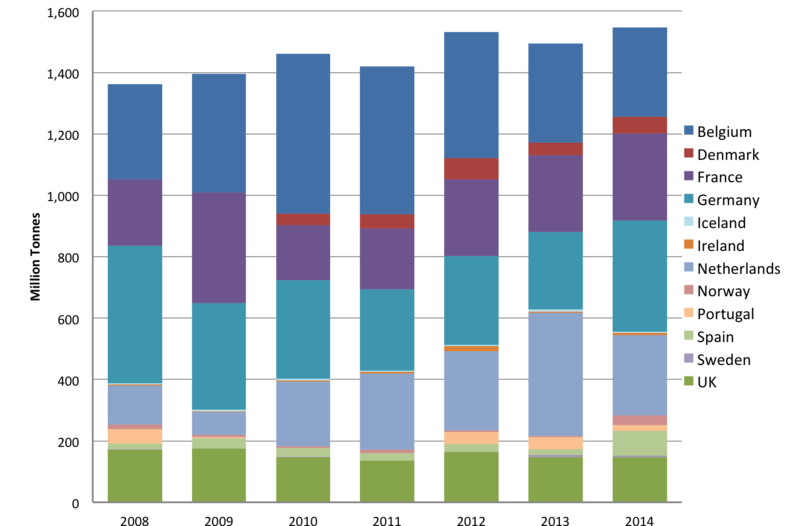 Average contaminant concentrations and total loads per country were calculated for cadmium, mercury, lead and tributyltin (TBT) for the period 2008–2014. Changes in total dredging quantities and total contaminant loads are dependent on external factors, including variation in sediment siltation rates due to storm events. The calculated average concentrations, in mg/kg, dry weight (dw), for the trace metals are comparable to those described in the OSPAR Quality Status Report 2010. Although yearly fluctuations can be seen, there do not appear to be any meaningful increases or decreases across the entire assessment period. Figure 2 shows the change in annual average calculated mercury concentration, per country for the period 2008–2014. Annual average mercury concentration varied between 0.17 and 0.23 mg/kg. These values are almost identical to those reported for mercury in the previous assessment period 2003–2007 (0.18–0.22 mg/kg). 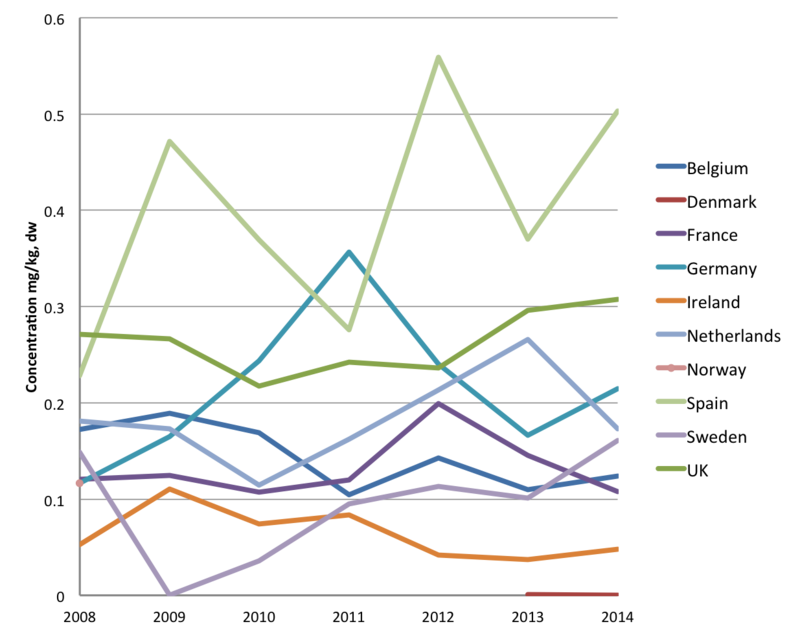 Figure 1: Total amounts, in millions of tonnes, of dredged material deposited in the OSPAR Maritime Area per country, per year, over the period 2008–2014. 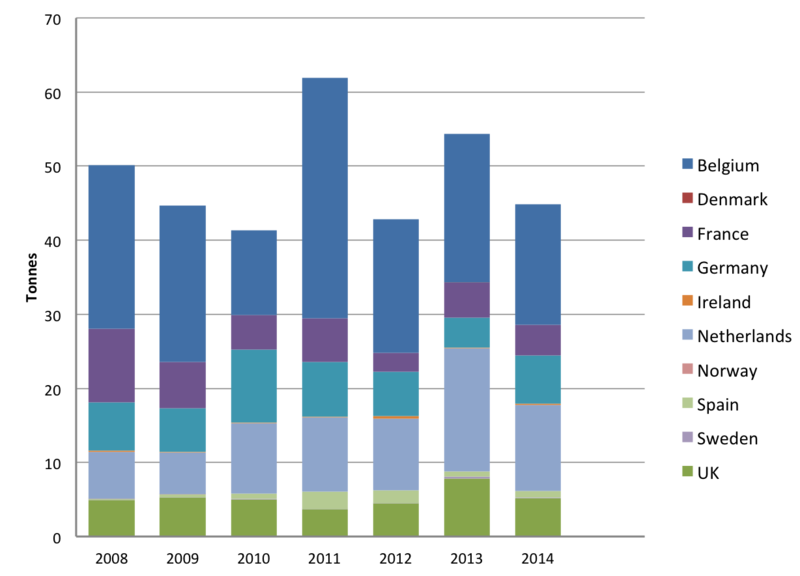 Figure 2: Annual average mercury concentration (mg/kg, dw) in dredged material deposited in the OSPAR Maritime Area. 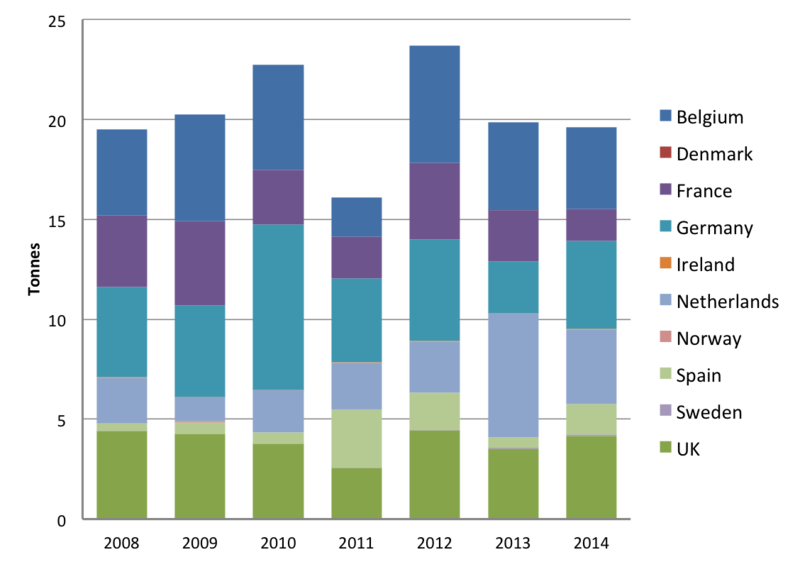 Figure 3 shows the total mercury load deposited in the OSPAR Maritime Area through the dumping or placement of dredged material by Contracting Party for the period 2008–2014. Trends cannot be accurately determined from these data owing to changes in the amount of material dredged each year; interannual variability is clearly apparent in the graphic. It must be noted that Figure 3 shows the total amount of mercury deposited, which includes the naturally occurring background level as well as anthropogenically-derived mercury. The net amount of mercury from anthropogenic sources transported from the dredging location to the receiving sites is therefore less. At present, there is no obligation under the OSPAR Convention for Contracting Parties to monitor the environmental impacts of dumping and placement operations, however many Contracting Parties undertake monitoring activities under national programmes. Beneficial use of dredged material (such as for beach nourishment and sediment recharge) has been monitored by OSPAR since 2013. This short period does not allow for trend analysis. The amounts for 2013 (28 million tonnes) and 2014 (37 million tonnes) are comparable; for both years beneficial use was implemented at approximately 80 sites. The most frequent reasons for beneficial use are beach nourishment and sediment recharge. 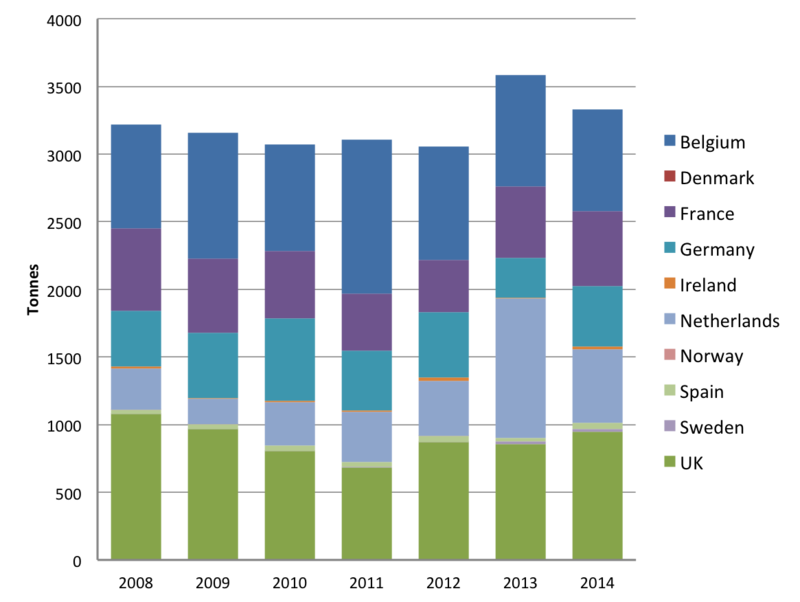 Figure 3: Total mercury load, in tonnes per year, deposited in the OSPAR Maritime Area through the dumping or placement of dredged material in the period 2008-2014 (data for Norway only available for 2008–2009 and for Denmark for 2013–2014). Over one thousand million tonnes of dredged material were deposited in the OSPAR Maritime Area in the period 2008–2014. See Figure b for a breakdown by country. This comprises approximately 85% maintenance dredging and 15% capital dredging. Contaminant loads are highly dependent on the frequency and intensity of dredging activities. The intensity of capital dredging can vary strongly between years, because it is dependent on various external factors (e.g. financing, infrastructure projects). External factors can also influence the need for maintenance dredging (e.g. financing, increasing vessel size, storm events). It is therefore not relevant to analyse change in total dredged amounts or in total contaminant loads. Contaminant concentrations however are an effective way to assess changes and have therefore been analysed. While there are datasets available for many contaminants, this assessment focuses on cadmium, mercury, lead and tributyltin (TBT) owing to their environmental relevance and the completeness and quality of the data available. 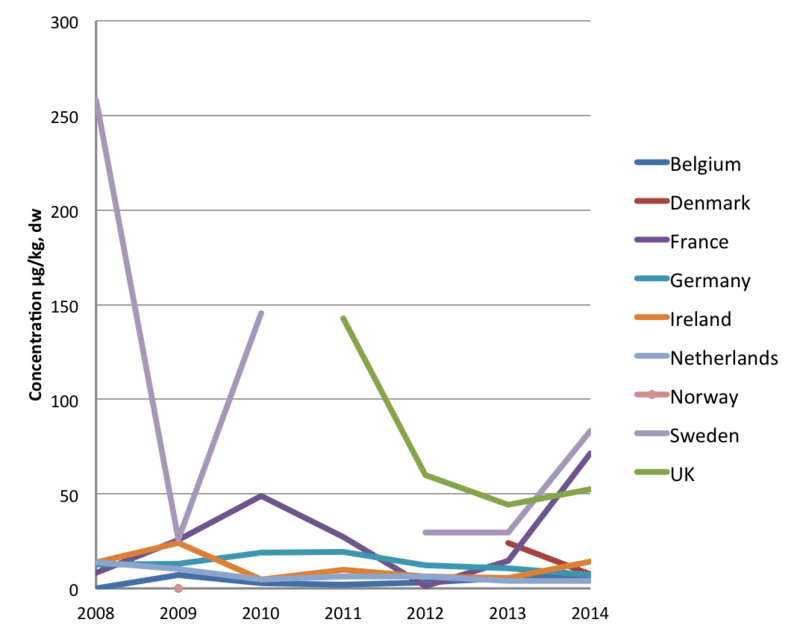 The previous OSPAR assessment of the environmental impacts of dredged material, examined changes in total metal trace concentrations for the period 1995–2007 (OSPAR, 2009). As shown in Figure c, average concentrations, in mg/kg, dry weight, across the OSPAR Maritime Area for the period 2003–2007 fell within the ranges: cadmium (0.3–0.95 mg/kg), mercury (0.18–0.22 mg/kg,), and lead (28–32 mg/kg). Concentrations did not decrease significantly in the period 1995–2007, except for polychlorinated biphenyls (PCBs), polycyclic aromatic hydrocarbons (PAHs) and tributyltin (TBT). Average concentrations for TBT in dredged material were not reported in the previous assessment; the OSPAR Guidelines for the Management of Dredged Material at Sea (OSPAR Agreement 2014-06) do not require organic substances to be determined in all circumstances, thus complete data sets for such substances are lacking. A case study for the Port of Rotterdam showed a marked decrease in TBT for the period 1999–2005 (OSPAR, 2009). Results for the annual average concentrations of cadmium, mercury and lead by country in the current assessment period (2008–2014) show the same pattern as for the previous assessment period (1995–2007); namely, no apparent decrease or increase. Figures d-f show the results for cadmium, mercury and lead respectively. The minimum annual average cadmium concentration in the present assessment (0.36 mg/kg) is comparable to that in the previous assessment (0.3 mg/kg), whereas the maximum (0.45 mg/kg) is markedly lower. For mercury the annual average concentration range in the present assessment (0.16–0.22 mg/kg) is similar to that of the previous assessment (0.18–0.22 mg/kg). In terms of the minimum and maximum annual average concentrations, lead shows a small decrease in the present assessment (23.97–27.98 mg/kg) relative to the previous assessment (28–32 mg/kg). The average calculated concentration for cadmium, mercury and lead are comparable for most countries. The values for TBT are shown in figure g and the average concentration ranges between 15.11 µg/kg and 53.72 µg/kg in the period 2008-2014. For TBT it should be noted that values can vary widely between sampling locations, which means average values are not a good reflection of overall change in the OSPAR Maritime Area. The total quantities of dredged material dumped or placed within the OSPAR Maritime Area, and thus the total contaminant loads are based on capital and maintenance dredging activities. These are dependent on various factors (e.g. 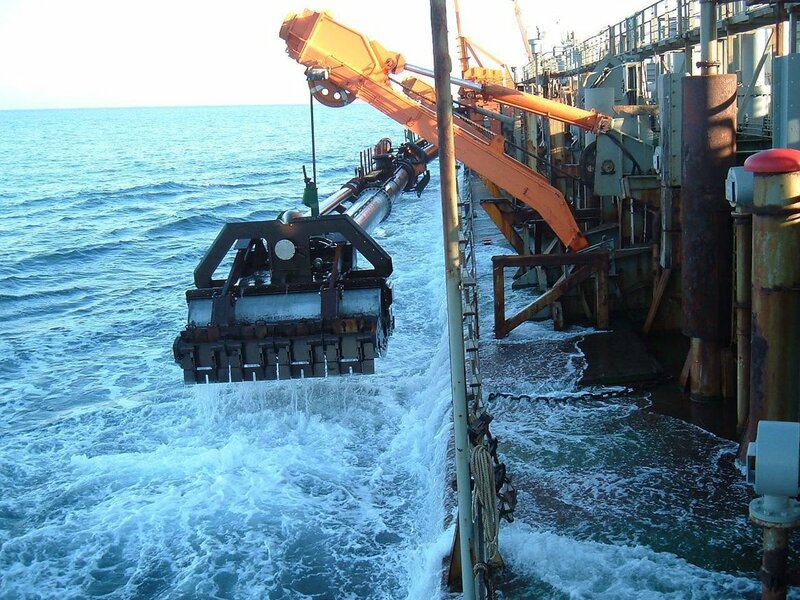 projects started, intensive or less intensive maintenance dredging, storms, etc.) and it is therefore not advisable to try and derive a trend in the total load. In addition, it should be noted that there is significant uncertainty when comparing national total trace metal loads between countries due to incomplete reporting and differences in the analytical approaches. Therefore, the overall total trace metal load for all Contracting Parties can only be regarded as an order of magnitude estimate of loads. 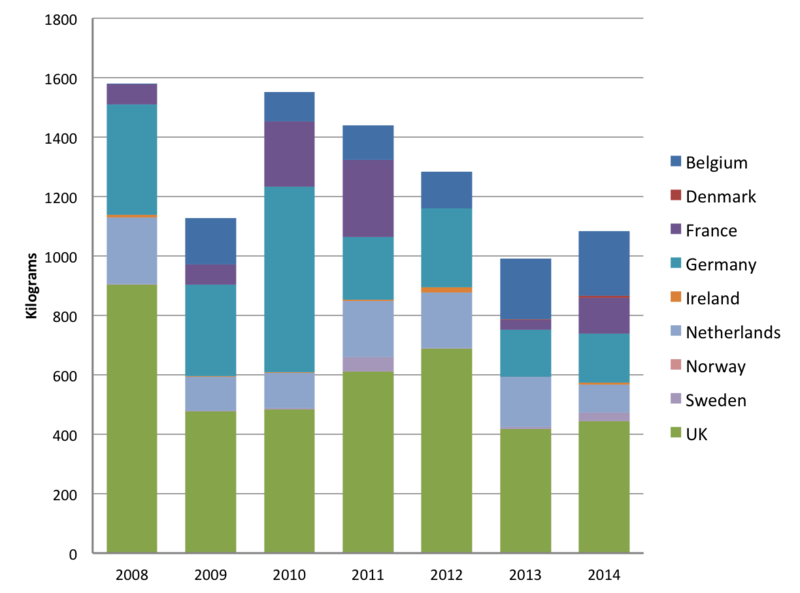 Figures h- k show total loads for the period 2008–2014 for cadmium, mercury, lead and TBT. Differences in contaminant loads between years and Contracting Parties are a function of the amounts dredged and dumped, and the changes in contaminant concentration in the dredged material. For example, the total cadmium load for Belgium in 2011 was higher than in 2010 or 2012. 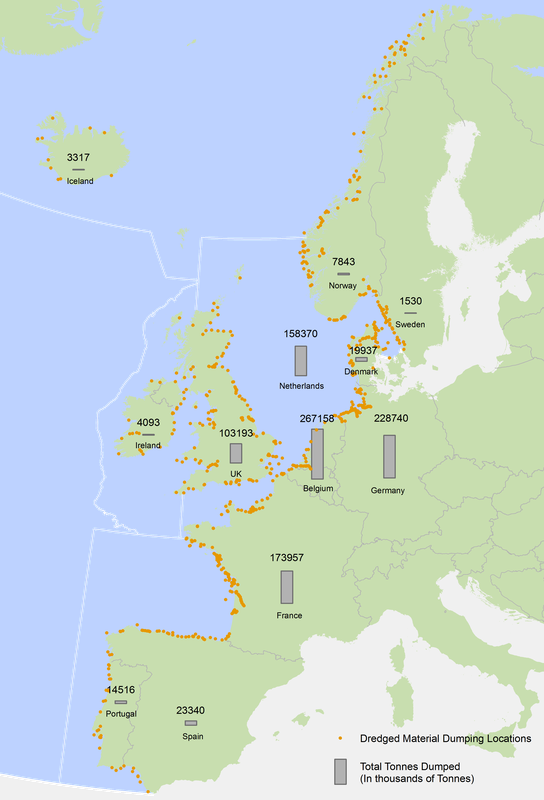 This can be explained by an increase in maintenance dredging in the River Scheldt in 2011. Extensive capital dredging in the River Scheldt ended in 2010, making 2011 the first year where the full effects of capital dredging on maintenance dredging work could be noted. Maintenance dredging for sandy material has been constant in the Lower Scheldt since 2008; whereas maintenance dredging for finer material peaked in 2011 (IMDC, 2015). In addition, cadmium concentrations measured in areas with intensive dredging were higher for 2011 then for 2010, albeit still within the expected range. The combination of these two facts leads to a higher total load for cadmium in 2011 for Belgium. In France, monitoring of disposal sites are based on the OSPAR Guidelines, which form part of the guides published by the French Study Group on dredging and environment, called GEODE. The monitoring is generally required by dredging and dumping authorities. Disposal of dredged material from the Grand Maritime Port of Nantes-Saint Nazaire has been permitted at the ‘Lambarde’ site since 2009. As part of this authorisation, monitoring of benthic communities on the disposal site and the Loire estuary are conducted every two years. In autumn 2013, 54 samples were taken: 23 in the Loire estuary and 31 over the area of the Lambarde and its surroundings. Six replicates are made for each sample: five to characterise the benthic fauna and one for the particle size. Several indicators are used to monitor changes in population compared to the reference state measured in 2008 (i.e. average species richness, medium abundance, taxonomic group abundance, biomass, ecological clues). The benthic communities in the dumping areas, or located nearby, are affected by sediment plumes and regular deposits. At the Lambarde disposal site the predominant species are crustaceans and annelids, which are mobile and well adapted to the increase in turbidity. The sampling period is an important parameter for evaluating the evolution of ecosystems: a sample during the recruitment phase (June to September) can lead to an over-estimation of the population, while the end of winter (March to mid-April) is a period of minimum abundance. In the case of long-term monitoring, it is important to consider both situations. The environmental impacts of depositing dredged material are investigated in Germany in the context of capital dredging as well as maintenance dredging. This is achieved by applying the OSPAR Guidelines (OSPAR Agreement 2014-06); in Germany, implemented within the ‘GUEBAK’ (Joint Transitional Arrangements for the Handling of Dredged Material in German Federal Coastal Waters) as well as in elaborating sediment management plans. Investigations of deposit sites in use identify effects by comparison with reference sites. An example from the Elbe estuary is the investigation of the deposit site ‘Elbe km 738’ with depositing 3.5 million cubic metres per year dredged material comprising mud, fine and medium sand. The main findings in terms of substantial effects are: slightly modified grain size structure due to sedimentation at the deposit sites, and an increased supply of fine material due to depositing a mix of mud and fine sand. The macrozoobenthos at the site and in the surrounding area is characterised as ‘very good’ on the basis of the M-AMBI (Borja et al., 2000), one of the routinely used indexes in the EU Water Framework Directive 200060/EC. For a few species (e.g. Macoma balthica or Scoloplos armiger) slight effects were detected. The overall assessment (M-AMBI) of the biocoenosis outside the deposit site resulted in a classification of ‘very good’. ‘Beneficial use’ is defined in the OSPAR Guidelines (OSPAR Agreement 2014-06) and includes activities in the following categories: beach nourishment/sediment recharge, coastal protection, construction (or engineering), land reclamation, habitat generation / improvement, and other. OSPAR has been compiling data on beneficial use of dredged material since 2013. In 2013, 84 activities were reported to have used 28 million tonnes of material beneficially, with beach nourishment/sediment recharge the most common option. In 2014, the number of beneficial use activities reported was similar at 80, with 37 million tonnes of material used beneficially; again, beach nourishment was the most common option. At present, there are insufficient data to allow an assessment of trends in beneficial use for the IA 2017, but it is hoped that the next OSPAR Quality Status Report can also assess this aspect. Dumping or placement of dredged material at sea is common practice within the OSPAR Maritime Area. No changes were detected for amounts of dredged material dumped or placed, for contaminant concentrations or for contaminant loads within the period 2008–2014. The range of concentrations for trace metals is consistent with the QSR 2010 assessment. Dumping and placement of dredged material is well regulated by OSPAR and the related regulations of the Contracting Parties. Together with European Union regulations, these have led to a reduction in pollution from dredged material in the past decades. However, there is a need to look further into the possibilities for harmonising assessment methodology and objectives, as well as for technical developments that would enable the detection of chemicals of emerging environmental concern, and thus reduce pollution further. The 2014 data show that there are many cases where dredged material is being put to beneficial use. However not enough data have been collected on placement activities for a trend assessment to be undertaken. At present, dumping or placement of dredged material at sea is common practice within the OSPAR Maritime Area close to the coast. No changes in the scale of dumping or placement can be observed. A prediction of future developments is difficult: increasing use of bigger vessels and the requirement for increased draft could lead to an increase in the amounts of dredged material, however increased use of management plans, resulting in more optimised dredging approaches, might result in a decrease in the total amount of dredged material. It has not been possible to detect meaningful changes in the concentrations of trace metals and TBT in the dredged material dumped or placed at dump sites, however the range in annual average concentrations for the period 2008–2014 for trace metals (lead: 24–28 mg/kg, mercury: 0.16–0.22 mg/kg; cadmium: 0.36–0.45 mg/kg) was consistent with the previous assessment covering the period 2004–2008. For TBT annual average concentrations in the present assessment range between 15.11 and 53.72 µg/kg but it is not possible to compare these against the previous assessment because that only used concentration data from a case study on the Port of Rotterdam. No meaningful changes in loads for trace metals and TBT were detected, although levels are relatively stable nonetheless. This matches the findings that there are neither meaningful changes in amounts of dredged material nor in concentrations for trace metals and TBT. Annual reporting on dumping and placement operations at sea allows an assessment of the location, scale and (potential) chemical disturbance of dumping/placement operations at sea in the OSPAR Maritime Area. The need for consistent data reporting and data calculation remains, especially for contaminants. There is also significant variation in the particle size fraction analysed and the extraction techniques used for trace metals. These make comparison between different countries problematic (OSPAR, 2009). Data reporting varies greatly between countries and could be improved by a more uniform approach. Since revisions to the OSPAR Guidelines in 2014, OSPAR annual reporting now differentiates between ‘dumping’ as the deliberate disposal and ‘placement’ in all other cases. The data from 2014 onwards show that there are many cases where deposits of dredged material are being put to beneficial use, but that not enough data have been collected on placement activities to enable a trend assessment. the sediment is dumped/placed during appropriate time windows (e.g. excluding spawning seasons) to reduce impacts. The OSPAR Guidelines encourage Contracting Parties to develop dredged material management plans on local, regional and national levels to reduce adverse effects and maximize positive effects. These should also include recommendations that the dredged material should be put to beneficial use instead of dumping it in the OSPAR Maritime Area. Reporting on management plans is not included in the reporting format, however publications from Contracting Parties show that many have established management plans to follow these principles. 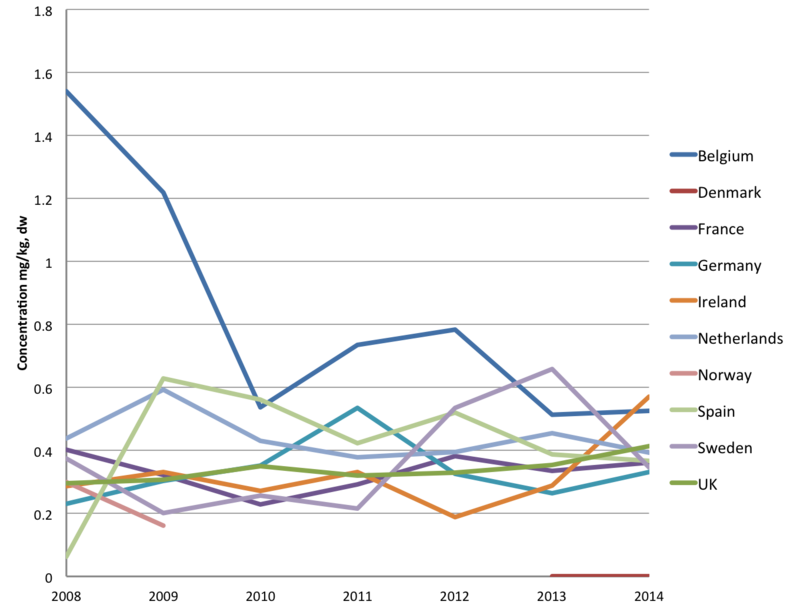 The number of countries developing sediment (dredged material) management plans has increased. One example is presented from Germany, describing the approach to cope with historic pollution within the catchment area of the River Elbe accumulating in problems influencing maintenance activities in the estuary as well as in the adjacent North Sea. Although there has been a great decrease in contaminant concentrations in sediments in the estuary of the River Elbe there is still a concern about the remaining contamination. Dredged material contaminant concentrations in the Elbe can be above upper action levels, which hampers its management. This concern has led to several activities. In 2008, the responsible authorities, the Waterways and Shipping Administration and Hamburg Port Authority, presented ‘River Engineering and Sediment Management Concepts for the Tidal River Elbe’. Both authorities have appointed an international Expert Group to evaluate their River Engineering and Sediment Management Concept for the Tidal River Elbe. System studies from the German Federal Institute of Hydrology combining environmental measurements as well as model based investigations elaborated recommendations for an improvement of the existing maintenance concept. A dialogue board with all stakeholders along the Elbe estuary discussed the situation, including problems and possible solutions. Discussions about the implementation of an Estuary Partnership (one recommendation of the international Expert Group) are ongoing. As well as aiming to improve the situation within the estuary by improving the sediment management concept, an attempt was made to reduce contamination in the catchment area. A comprehensive study resulted in an evaluation of possible contamination sources along the course of the river and a sediment management concept for the river as a whole. In addition, the project ‘ELSA’ (pollutant clean up Elbe sediments) aims to reduce the contaminant situation of the River Elbe especially in relation to its sediments; also a requirement of the European Union Water Framework Directive and the European Union Marine Strategy Framework Directive. The Federal Laender and the Czech Republic also acknowledged their responsibility in improving the ecological status of the River Elbe and the adjacent North Sea. Dumping and placement of dredged material is well regulated by the OSPAR Guidelines and the related regulations of the Contracting Parties and there is no need for OSPAR to develop new measures. OSPAR, the European Union and national regulations have led to a reduction in pollution from dredged material in the past decades, however continuing efforts are required to reduce pollution further. There is a need for better harmonisation of assessment methods and objectives, as well as for technical developments to enable the detection of chemicals of emerging environmental concern. The beneficial use of dredged material should be increased, where possible, to avoid deliberate disposal. Sediment management, including management of dredged material at sea, is not only important for reducing possible harmful effects within the marine ecosystem but also for mitigating sea level rise through coastal protection. This will become increasingly important in the future. While there has been research on the impacts of dumping and placement of dredged material on the marine environment there are emerging issues. These include the effects and amounts of microplastics and marine litter in dredged material and the identification of new contaminants of concern. These require further investigation. OSPAR collects data to support the management of dredged material, not for environmental monitoring purposes. As this is a limited data set, to improve the quality of future dredged material assessments, it would be beneficial to look into how data is collected and the analysis is undertaken. Concepts and methods for cumulative impact assessment could also be considered. In recent years, marine litter has been identified as an emerging concern. Knowledge gaps associated with microplastics and marine litter in dredged material include: identification within sediments, analytical techniques, and identifying impacts. New chemicals are constantly being developed for use in everyday life (e.g. brominated flame retardants) and may ultimately end up the marine environment. Those with properties of persistence, bioaccumulation and toxicity may accumulate in dredged material and have adverse impacts on the marine environment and may require the development of baseline levels. OSPAR collects data to support the management of dredged material rather than long-term environmental monitoring. As this is a limited data set if it is decided to improve the quality of future assessments it will be necessary to change the way the data are collected (e.g. to collect measured concentration values) and improve the harmonisation of analyses. Concepts and methods for cumulative impact assessment should be developed and used for the assessment of human activities, including dredging and dumping. Environmental Impact Assessments (and associated monitoring programmes) should be used to assist cumulative impact assessments. Borja, Á., Franco, J. & Pérez, V. (2000): A marine biotic index to establish the ecological quality of soft-bottom benthos within Europeanestuarine and coastal environments. Mar. Pollut. Bull. 40 (12), 1100–1114. Scheuhammera, A. et al. Recent progress on our understanding of the biological effects of mercury in fish and wildlife in the Canadian Arctic. Science of the Total Environment 509-510 (2015),p 91-103. Vivian, C.M.G. (2003) Regulation of dredged material disposal at sea in North-West Europe by the OSPAR Convention. 'Dredging '02: Key technologies for Global Prosperity', Orlando, Florida, 5-8 May 2002, (Ed.) S Garbaciak, American Society of Civil Engineers, Session 1D, 13 pp. OSPAR Convention, Annex II on Prevention and elimination of pollution by dumping or incineration, Article 4, Paragraph 3. OSPAR Agreement 2014-06, OSPAR Guidelines for the Management of Dredged Material at Sea. OSPAR (2009), JAMP assessment of the environmental impact of dumping of wastes at sea. OSPAR minimises adverse impacts on the marine environment through its guidelines for management of dredged material and through actions addressing substances found in dredged material at source. This assessment addresses the tonnages of dredged material deposited and loads and average calculated concentrations of cadmium, mercury, lead and TBT from 2008-2014.